Fright Nights: AS ABOVE SO BELOW | Warped Factor - Words in the Key of Geek. Da'Mon Guy ventures into the catacombs. Horror films have long been one of the more beloved genres in the movie industry, with recent years seeing film makers looking for ways to re-invent the genre and find new angles to induce chills and thrills into their devout fans. Back in the late 90’s The Blair Witch Project assembled a very simple formula - the use of unknown actors and a reality like camera angle. It's popularity was unforeseen but very quickly capitalized upon, as the genre now had a new cost effective and highly successful ploy. Countless numbers of movies appeared in its mold, like Apollo 28, Open Water, and Afflicted, to varying degrees of success. We can now add one more. As Above So Below is a disconcerting, spooky manifestation that entails a search for one of the mythical treasures of the earth, the philosophers stone. It’s a little known thriller that hit the theaters in relative anonymity in early 2014. It might've been overlooked by many at the time but it is worth tracking down on DVD or streaming service. The movie has a good intensity, especially in the early moments. It’s billed as a horror/suspense feel but it really has a kind of R-rated Raiders of the Lost Ark/National Treasure feel to it. It's the story of a team of explorers who venture into the catacombs beneath the streets of Paris. There they uncover a dark secret that lies within this city of the dead. The film has a really good theme that speaks to nearly everyone who takes the time to view it. As Above So Below is a journey into self-regret and sorrow that forces one to recognize their own sins and inner demons. While it may not have the best delivery to the story, it clearly has one of the more interesting and relatable themes in some time. It really grabs a hold of your intention almost immediately, sucking you in with its engulfing nature, which won't allow you to turn away for the first 30-40 minutes. You quickly find yourself as intrigued by the quest for the Philosopher’s stone as the protagonist is. However, somewhere about the midpoint of the film, that grip begins to ease up and the movie quickly falls to mediocrity. One of the most glaringly noticeable aspects is its choice of cinematography. As noted above, As Above So Below is yet another tale told in the 'Blair Witch'/first person camera angle style. It has mixed success with this format. In the early stages it really puts you in the middle of the action, even giving it an adrenaline inducing feel that preys on one’s natural fears. Conversely, the camera choice hurts the climax of the film. It has far too much rapid movement and quickly hampers the enjoyment of the film. The cast is comprised of mostly unknowns, which is a formula that seems to go hand in hand with the cinematography, and led by Perdita Weeks who does an admirable job as Scarlett. 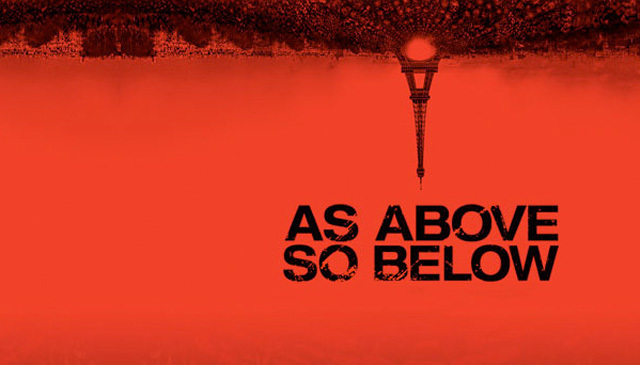 As Above So Below is a film that is surprisingly better than I expected, and I was actually shocked how locked into it was for a good part of the movie. I think if it hadn't adopted the first person perspective then it could have turned out significantly better, but it still managed to create a good level of tension and anticipation that is, mostly, maintained throughout. For pure horror lovers, it may fall short, but for most everyone else the film will stir some stark tension within you. Da’Mon Guy is a writer and artist, a graduate of Coppin State University and an avid, life-long lover of film. Da'Mon has been actively writing movie reviews since 2011. Check out more of his work at Examiner.com, where he has published over 400 reviews. Visit his Blog and follow him on Twitter.